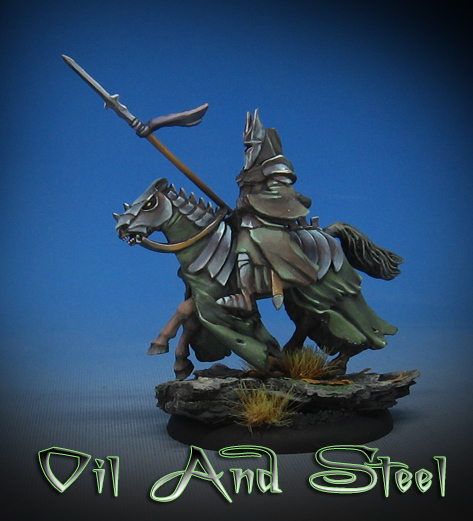 Here's another Morghul Knight painted primarily with oils, and then finished off with acrylics. As I have mentioned before, the oil paints provide a number of advantages. First, I can work on more figures at once, since the paint will remain wet on the figures far longer than the acrylics. This also means that I can blend more interesting colors together in the shadows and mid tones. It can make Non Metallic painting much easier as well, since the metal needs to have a lot of reflected colors. We tend to think of more limited palettes for metals, simply various blue gray colors. I will be creating more demonstrations on oil painting this month for the Patreon page, which will be available to the patrons to view on YouTube or even get physical copies on USB drives. I think you can see some of the purples and umber colors which I worked into the metals, which are also meant to compliment the greenish tint to the blanket on the horse. Adding in 'new' colors and blending them into what is already there is a much easier task than many glazes of acrylic paint. Since it is easier to do so, it makes it more likely that you will try to put in unusual colors, as blending them and toning them down happens all at once. As for the base, that was done with tree bark, while the tufts and leaves were from Green Stuff World. I have a number of tutorials on the blog and on my facebook page in the form of live sessions!